Several months ago, while I was visiting family, someone mentioned that he had just returned from a sermon on Ezekiel 16. We asked, “what did the pastor say?” “Do what God wants or else.” If you don’t know Ezekiel 16, have a read: it tropes Israel as a foundling that God raises, pimps out, marries, and then casts out for sleeping around. It might not strike you that “do what God wants or else” is the best or even an adequate reading of the strange sexuality of this chapter, but, armed with Simpson’s Burning to Read, you can at least have a sense of the faithfulness of such an interpretation to early modern “Evangelical” (Simpson’s locution in preference to the anachronistic “Protestant”) hermeneutics and soteriology. Likewise you will understand why I recall that Romans 3:23 (“For all have sinned, and come short of the glory of God”) was the favorite verse of my fundamentalist upbringing. If the reasoning upon which we base interpretation is circular, such reasoning is at some level a matter of faith. Words simply cannot serve as the guarantor for their meanings. We assume, as an act of faith, certain things about writers and about communicative exchange when we interpret. These assumptions are nonlinguistic. They can instead be fairly described as ethical assumptions, since they concern matters of communicative cooperation. Evangelical readers are paradigmatic circular reasoners, refusing to admit the motor of faith that drives them. They simultaneously idolized the ‘mere’ text, jettisoned non-textual contexts (such as traditions, reading communities, historical situation, and different speech situations), atomized the reader, made adherence to scripture impossible, and set up this very impossibility as the foundation of spiritual life (since one’s own sense of failure was a sign, perhaps, that one belonged to the Elect). For them, all readings necessarily ended in the same place, with the faith that brought the reader to their goal obscured–rather than supported by–the putatively empirical words of Scripture. This is all too familiar to me, since I spent every evening between the ages of 8-10 praying not to be sent to Hell, knowing all the while that because only my fear of God, and not my love of Jesus, inspired my prayer, that I was damned. My faith, such as it was, grew in soil thick with the despair, paranoia, and recriminations sowed by Tyndale and Luther. Burning to Read never quite clarifies what the despair sowed by the evangelicals choked out. This is odd, since Simpson is a medievalist. As a result, the medieval church implicitly comes off much better than it should (note that the same could be said for Simpson’s nearly exculpatory rationale for Thomas More’s persecution of Evangelicals). Given that the book is semi-popular rather than strictly scholarly, I can’t expect it to have the citational apparatus of, say, The King’s Two Bodies. Nonetheless, I wonder at the absence of any reference to Pelagianism. I also wonder at the absence of any reference to Reginald Pecock’s Repressor of Over Much Blaming of the Clergy (1450). In defending the mainstream Church from the Lollards’ refusal to hear any argument but those derived from scriptura sola, Pecock “asserts that whoever ‘expresseli’ bids any ‘gouernance’ to be carried out…’includingli’ bids all those further (unspecified) things to be done which logically flow out of the said ‘gouernaunce.’ Therefore one cannot rightly insist ‘that needis ech gouernaunce of Goddis … lawe and seruise muste be groundid expresseli in Holi Scripture'” (228 in this). Pecock’s argument helps encompass ecclesiastical traditions, the sacraments, &c, all this seemingly non-scriptural “dross” that the Evangelicals scorned, within scripture, while rescuing scripture from mere textuality, returning it to the vitalism of communities of faith as a lived experience. Surely this treatise, and the late 14th- and 15th-century English struggles to which it belongs, belongs in Simpson’s book? 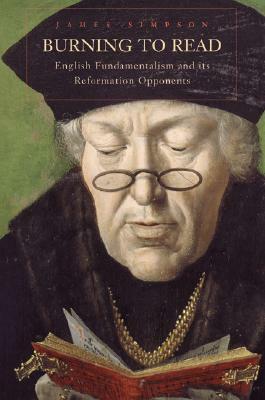 Without it, the debates of Tyndale, Luther, and More appear to be sui generis; with it, we would have been much better able to isolate the conditions that enabled Evangelical ascendence and all its nasty aftereffects. As a side note, the discussion of Josiah (who provides a model for the bloody effects of the ‘rediscovery’ of scripture) could have been made even more useful had Simpson observed that the struggles described are, so far as I know, actually within “Judaism” between the centralizing Temple Cult and the dispersed Shrine Cultists, rather than–as it’s portrayed in Scripture–between Hebrews and purportedly “foreign” deities. I must emphasize, however, that the above two paragraphs are grousing, ungenerous given how much I enjoyed the book, its argument, and its limpid prose. I simply wish, then, that Simpson, or his publisher, had provided a final page labeled “for more on these issues see” followed by a list of relevant books on the relevant late medieval controversies, a syllabus rather than just a bibliographic apparatus. This entry was posted in Book Reviews, MedievalBlog and tagged bible, christine doctrine, exegesis, james simpson, William Tyndale by medievalkarl. Bookmark the permalink.